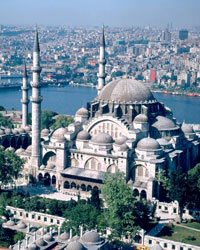 Straddling Europe and Asia, the Bosphorus strait is a powerful symbol of Istanbul. Chef Mehmet Gürs sails its waters to buy the ingredients for a great floating picnic. 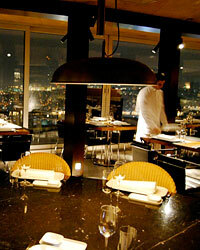 "Nothing beats seeing Istanbul from the water," declares the city's star chef, Mehmet Gürs. Gürs, owner of the outstanding Mikla restaurant, expertly steers his inflatable Zodiac boat along the Bosphorus Strait as million-dollar sailboats zoom past antiquated white public ferries. The cascading domes of 16th-century imperial mosques loom on the horizon. Up ahead, miles of green rolling hills curve toward the Black Sea. "By taking the water route, you avoid Istanbul's traffic, and you can dock at teahouses and fish restaurants on the shore," Gürs notes before declaring that the Bosphorus is the world's most scenic waterway. But we're not just sightseeing on the 18-mile-long channel that divides Istanbul into Europe and Asia: We're on a mission to pick up ingredients for a glorious lunch on the water that Gürs will make for friends the next day. Gürs is Istanbul's most recognizable chef, and not only because he was showcased on the Today Show when co-host Matt Lauer traveled the world. He owns multiple restaurants around the city: his avant-garde flagship, Mikla, and a sleek, whimsical fast-food joint, Numnum, which has seven locations. Gürs introduced his streamlined, contemporary food to Istanbul at Downtown in 1996, at a time when the only restaurant choices were old-school Continental and traditional Turkish. Now he's working on a new place, opening in late summer: a wine-centric place with inspirations as diverse as southern Italy and Scandinavia ("but no dilled salmon pizza," he promises). At Mikla, the panoramic spot on the 18th floor of the Marmara Pera hotel, Gürs channels influences from his Turkish-Swedish childhood into sharply modern dishes. He borrows Nordic smoking techniques to cook buttery Turkish lamb, which he serves with Barbunya beans braised in olive oil (a traditional Istanbul preparation); he flavors sliced Aegean grouper, a Turkish favorite, with cucumber and dill (the classic Scandinavian combination). Although he employs cutting-edge equipmenthe purees those Barbunya beans in a futuristic food processor called a ThermomixGürs also works with an anthropologist to research heirloom ingredients around Turkey. "You wouldn't believe what we've discovered," he enthuses. "Sheep's-milk tulum cheese that has been aged for four years, so strong it knocks your socks off; tiny olives from an Orthodox Christian village near the Syrian border that we serve at Mikla over crushed ice." A self-taught chef, Gürs was born in Finland and grew up in Stockholm, raised by a Turkish architect father and a Finnish-Swedish mother. "Foodwise, we had a split-personality household," he explains. "Turkish feasts for Islamic holidays; herring and pig's trotters for Scandinavian Christmas." Vacationing with his Turkish grandparents on the Black Sea, he remembers being blown away by how intensely flavorful even an olive could be. Summering on a remote Finnish island with his Scandinavian clan"all sailors," he reportshe learned to fish and hunt moose. From his Scandinavian grandmother, he picked up a recipe for a divine cake studded with berries. It's so easy to make that, as he's telling me about it, he decides to serve it at the next day's party. The meal Gürs is planning is earthy and simple, like the food he grew up with. After we dock the Zodiac, he spots people eating balik ekmek, the grilled-mackerel sandwiches vendors sell to ferry passengers at wharfs. "Aha! I'll do a version of them for my party," Gürs announces. He takes the opportunity to lecture me on Turkish fish cooking. "It seems basic," he says, "but there's an exacting art to it. Palamut [Black Sea bonito] has four names, depending on the size and season. When it's young and oily, you grill it; as it gets bigger, it must be fried." At the street market in Kuzguncuk, an enclave on Istanbul's Asian side that still evokes the city's Greek and Armenian past, we buy potatoes and black olives. Gürs will use them to make his "dirty potatoes," another Turkish-Scandinavian conceit: roasted new potatoes tossed with a pungent olive puree. The next morning, Gürs boards the motor boat he's borrowing from Vicem Yachts for his floating picnic. "A dreamy deck, a real kitchenit's perfect," he says. With him are his wife, Asena (an ace sailor, like her husband), and their cherubic four-year-old son, Bora (named for a northeasterly wind). The sky is typical of springtime in Istanbul: The sun glints off the minarets from behind dramatic low clouds. As a starter, Gürs is serving updated sarma, stuffed grape leaves, filled with herbed goat cheese, then warmed on the boat's grill. Asena and Bora make the colorful salad, tossing cracked wheat with roasted vegetables and tomato paste. When the guests arriveResit Soley and his wife, Sebnemthey're bearing bottles. Soley, formerly one of Turkey's busiest architects, is the country's top winemaker and the owner of Corvus Vineyards, the visionary winery that's helping revitalize the windswept Aegean island of Bozcaada, where Gürs is building a summer house. After lunch, Gürs brings out his grandmother's cake and unwraps marzipans from Meshur Bebek Badem Ezmecisi, one of Istanbul's last specialists in Ottoman-era nut confections. "These cost a fortune, but they have the pure essence of almonds," he says. Soley uncorks a fabulously concentrated Corvus Passito dessert wine made with Turkey's Vasilaki grape. We sail past a fortress built by the sultan who conquered Constantinople, past marinas full of fishermen's rowboats, past decrepit Ottoman palaces reborn as luxury hotels, toward the Baroque silhouette of the Ortaköy Mosque. Gürs was right: Nothing beats seeing Istanbul from the water. Food and travel writer Anya von Bremzen is the author of The New Spanish Table. She divides her time between New York and Istanbul, where she lives in an apartment overlooking the Bosphorus.